SAES is an expert in the complex area of signal underwater processing, developing advanced technology for security and defence in marine environments. A significant number of products developed by SAES have dual applications in the civil and defence markets, such as intruder detection sonar. Founded in 1989, SAES is classified as a strategic national company through NAVANTIA, INDRA and THALES its shareholders. SAES specialises in the study, design and manufacture of sonar systems and underwater technology for security and defence. ASW systems are based on sonobuoys for Maritime patrol aircraft (MPA), helicopter and surface vessels. Building on more than 25 years of expertise in acoustic processing, SAES has developed and manufactured a complete family of Sonobuoy Processing Acoustic Systems (SPAS) that covers both Air and Naval ASW operations. Prioritize the use of smaller and faster combat ships (LCS, OPC, Corvettes, FAC) able to share tactical and intelligence information. SAES recently participated at the Global SOF Symposium and ADEX 2018 from 25-27 September. DDS-03 is a high-frequency active sonar specifically designed to protect harbours, anchored vessels and critical infrastructures against underwater threats. This high-frequency active sonar DDS-03 has been specifically designed for the detection of underwater threats, such as divers and manned and unmanned underwater vehicles (SDV, ROV or UUV), off¬ering protection and surveillance against the potential threat in ports, critical facilities, shipwrecks, environmentally protected areas, special events, and anchored boats. The SOLARSUB RDTAS is a digital towed array sonar that is reelable from the platform by winch that allows the deployment and recover of the antenna. ROASW system is a two-system segment (surface segment ROASW-SS & airborne segment ROASW-AS) capable to operate an ASW / ASuW mission by means of controlling remotely from the ROASW-SS manned / unmanned air vehicle in order to receive via data relay (STANAG 7085 compliance) the acoustic and tactical information from sensors (passive, active and digital). Building on more than 25 years of expertise in acoustic processing, SAES has developed a complete family of Sonobuoy Processing Acoustic Systems (SPAS) that covers all martime patrol airfcraft (MPA) and Helo anti-submarine warfare (ASW) operations. If anything is changing the acoustic signature on-board the vessel, ONMS can be the difference between being detectable or not. Once detected a target, must be known, accurately and quickly, what platform it is and its characteristics. SAES has exhibited its DDS-03 diver detection sonar at the Oceanology International China 2017 Conference Forum. SAES is to provide Kazakhstan with its Diver Detection Sonar DDS-03, while an agreement has been signed to supply smart naval mines and range stations for signature measurement. SAES to Present ASW Solutions and Naval Mines at SITDEF, Peru. SAES will be participating at the SITDEF International Exhibition in Lima, Peru, from 18-21 May. SAES is to offer a conference about the increasing importance of the anti-submarine warfare and solutions to successfully confront the new challenges. 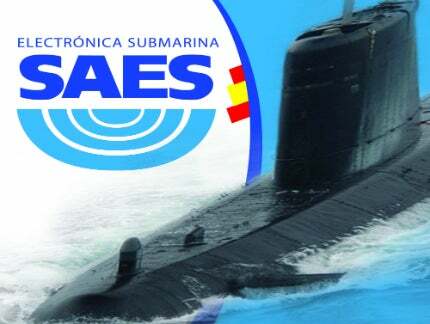 SAES, the only Spanish company that supplies anti-submarine-warfare systems (ASW), has been involved in meetings with important companies of the aerospace sector. The anti-submarine warfare and the Mine Counter Measure are two of the fields where the countries are focusing in order to control the underwater domain, which is a priority because of the new geopolitical scenarios. Presenting at EXPONAVAL (stand 310-N), SAES will offer a conference about the present and future of the ASW war and how to successfully confront the new scenarios. SAES explains the conclusions and results deal with their participation in the European program CLOSEYE. SAES has developed a system based on sonar technology in order to detect the small boats typically used on illegal activities. The DDS-03 is being showcased in the Navantia booth (QP45) at Monaco Yacht Show from 28 September to 1 October. SAES is participating at DX Korea 2016 (stand 8C-11) to promote their products and services in north-east Asia, a region where new solutions for protection and security of coasts have an increasing demand. The study is based on the analysis of the multi-influence signature generated by the vessels as a basis to classify them. The integration of the ROASW system of SAES in the Land Based Test Site (LBTS) for the systems that FABA designs and manufactures) of CATIZ has been successfully performed this week. The increasing human interaction with the marine environment is bringing about a continuous growth in the ambient noise levels, which aggregates to the traditionally existing noises produced by natural sources. The SAES Multi Influence Range System (MIRS) for surface vessels and submarines provides real influence measures (magnetic, electric, pressure, acoustic, and seismic) in a real and controlled scenario, to successfully counter related threats. SAES - SA Electrónica Submarina, specialist in Underwater Electronics, is hosting a stand (Hall 2 - 204/G) at IDEF 2015 from May 5 to 8.